rain, layouts, and more pics from Canada. It’s raining cats and Miniature Schnauzers over here. It has been since yesterday, and it doesn’t look like the rain is going to let up anytime soon. Even though it’s freezing and wet outside, I still finished all of the errands I needed to do. I even had the chance to finally sit down and create. I usually don’t scrap with black and white photos, but I specifically used one for this layout. I love the pops of red I added to the To Love & Cherish line. Honestly, what do you think of this one? I really like the color scheme to this line. Everyone must know by know that I LOVE using browns and greens, but sometimes yellows and reds and fun to play with too! 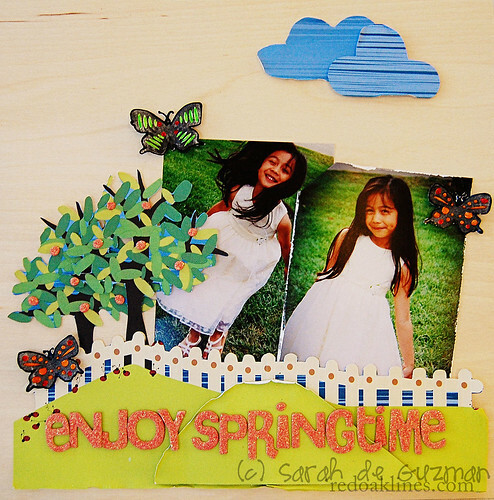 The last layout for today is all about spring. The cold weather outside inspired me to think of warmer weather! I could really go for a warmer day right about now. BRR! I stamped and added some color to my butterflies using some of the brush pens that Tombow had sent to the Imaginisce DT last month. …and because I promised to share more photos from my trip to Canada, I uploaded more of my photos today. 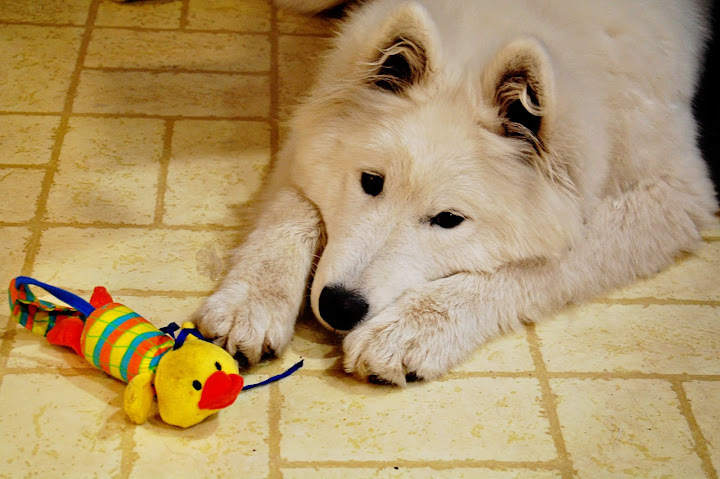 Kiki's furbaby takes a break from the hard work -- chewing on toys! 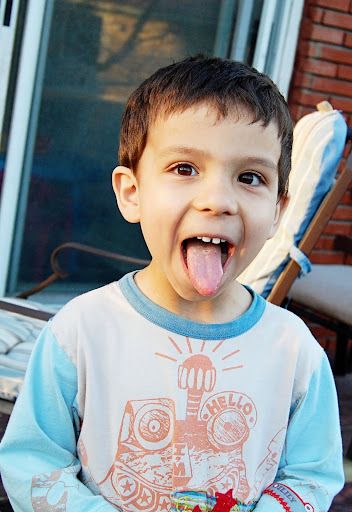 I miss this little man! He was too much fun! It was so fun to see and teach everyone! We definitely had some good times at ScrapFest! I did a MnT featuring the BIA. Once a Zutter Zister, always a Zutter Zister. Now, it’s time for me to do my workout for the day. I love the design to your “the boys look alike”. Beautiful photos from the trip too. Thanks for sharing them! HI Sarah! Love your LO’s! Especially the fun spring one! 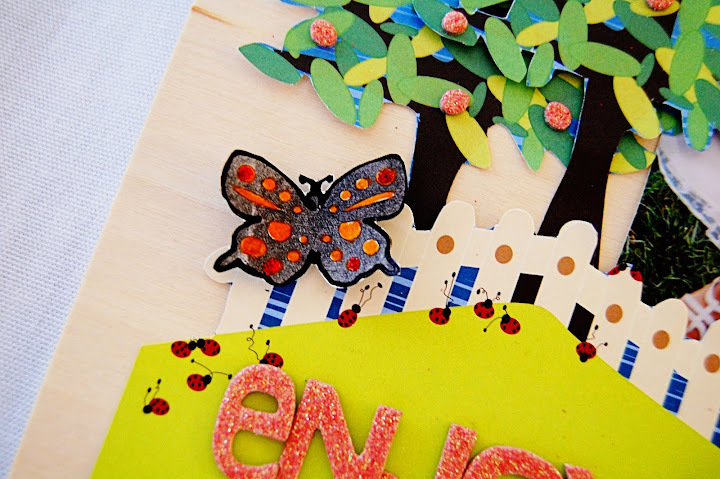 love those butterfly stamps too! 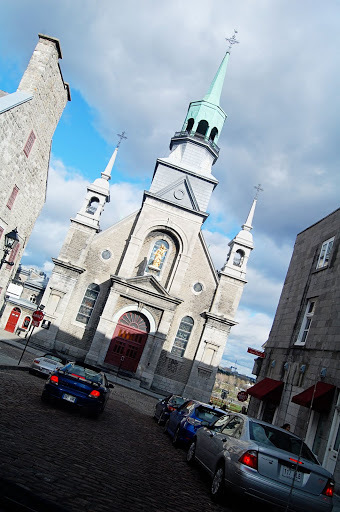 I went to Montreal in November and just loved it! 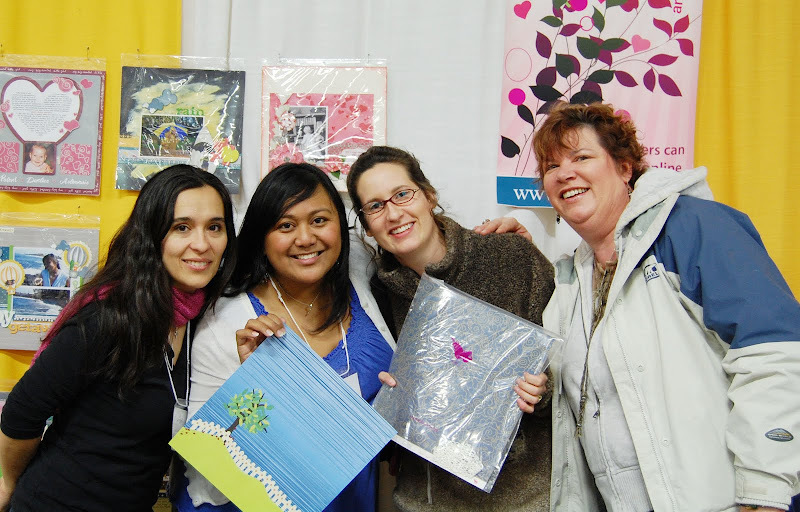 Happy to hear you had such a great time at Scrapfest! Love the layouts! Thinking the rain should be over any minute now. great pics of your trip. nancy — i wish it was over! when are we gonna crop?! love your LOs. 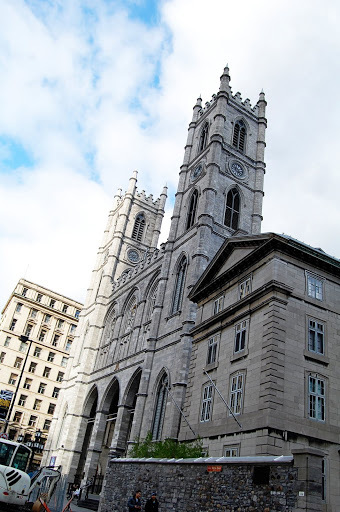 one question, why are your photos of montreal of religious institutions? what happened to cobble stone and the hip and happening? haha. raining miniature schnauzers…that is a new slang. will have to use it some time. 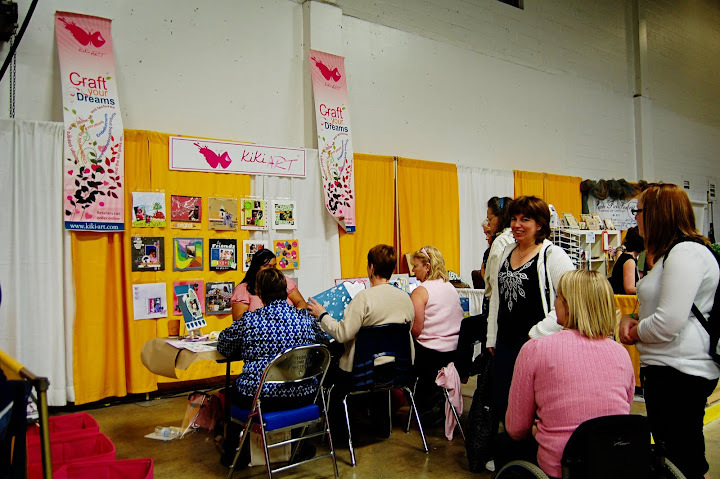 Love your layouts – the black/white is so unusual for you but it’s wonderful – so glad you are back and glad that you had such a good time – Scrapfest looks like fun. Have a great rest of the week and hope the sun comes out! gorgeous work (as usual!!!) 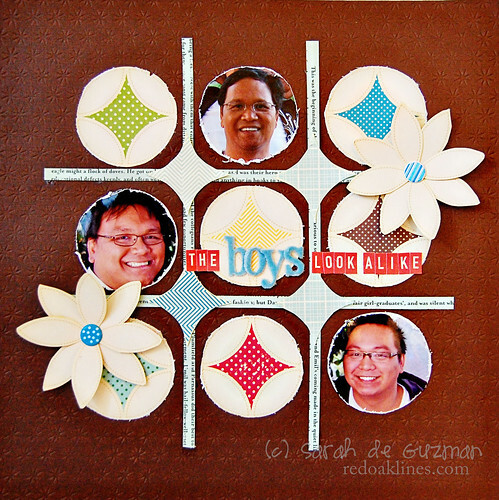 really lovin’ the design on “the boys look alike” layout!!!!! It was really nice meeting you last weekend. Your smile is even lovelier in person! I hope you had a great time in our “home and native land”. Looking forward to be inspired by works as usual. Love your LO’s Sarah! So glad you had fun on your trip. 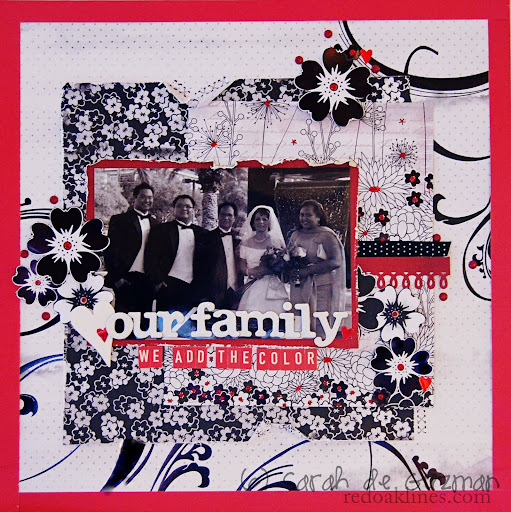 Your red, black and white layout is just stunning! Love your other layouts too! Great pictures! The rain is no fun, it rained quite a bit here the last couple of days and tried to snow yesterday. 😦 Come on spring…I’m waiting! LOVE the design on the boys LO…great job!! Love your LO’s, love the one with your fam, so gorgeous!!! Great photo’s again!! And I am so sorry about your weather, it’s COLD here too but we haven’t had any rain for qiut some time!! they say this weekend will be better!!! Cute LO’s, Sarah! My fav is the OA page… such a fun design & a great color combo! And PS… it’s the Sept. ST. And, yes, I know about the free copy. That reminds me… I need to email you about that other pub we’re in. Have you seen the most recent call? It said on there that you get a free copy. I’m like, HUH? What are WE, chopped liver? LOL! ohhh love the black and white layout and pic… actually truth be told I love them all! fun pics too. Just love all the creations…they are soooo perfect!!! I so enjoy looking at all the detail and love that you put into each piece of ART! 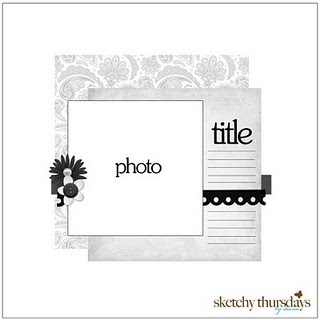 Love your scrapbooking pages. I’ve done some scrapbooking in the past, and I need to get back to it. Will definitely have to use your sketches as a prompt to get me back in the swing of things. Like I said I’m sooooooooo behind… but I love the layouts and your photos… looks like you had a wonderful time…. love the layout with the CI real woods + Kiki… fun!! !